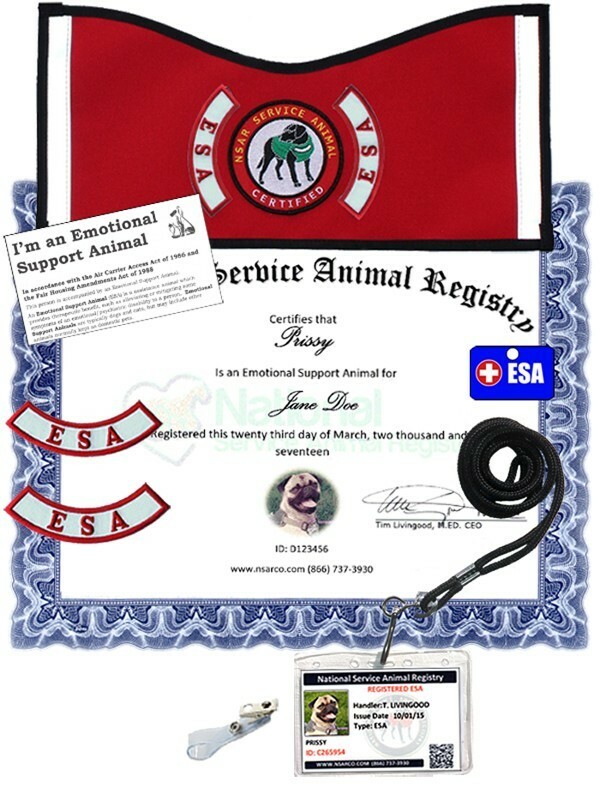 Congratulations on qualifying to have an emotional support animal (ESA). The NSAR Deluxe ESA Kit has everything the Essential ESA Kit has, plus: ID Card Holder with Neck lanyard, Electronic Copies of Certificate & ID card, 25 foldable ESA Information Cards,an ESA Vest with Patches sewn on and an ESA Collar ID Tag. This kit saves you money on the items you you want and need. REMEMBER: Registration with NSAR comes with a "No-Risk" money back guarantee! 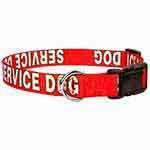 Click on the Kit Contents tab below to view all the items that are included in the Deluxe Service Animal Kit. 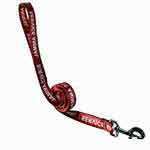 Quick (and free) shipping, and the products seem to be very well made. just like they advertise. Highly recommended! At first I was a little worried about ordering because there are a few certification agencies to choose from. When the representative told me NSAR has a 30-day money back warranty, I decided to take a chance. Glad I did now! I also ended up using the company NSAR recommends for a prescription letter, Chilhowee Psychological Services. I couldn't be happier with the experience. Got my order in two days! Everything is made in America and I like that. Good quality ID cards and the ESA vest makes it so much easier to go out in public with him. 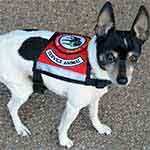 I was especially surprised Sam's Club just waived me on through now that my dog wears his vest. Ordered this kit after a LOT of research and so glad I did. 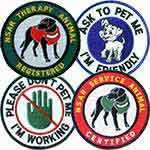 I live in an apartment complex that allows only cats and the ESA vest and patches has calmed all my nosy neighbors down when I take my dog out to do her business. Before that they were always calling management on me. Well worth the money! 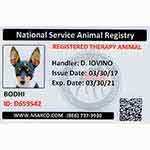 My therapist suggested NSAR for ID cards and a vest so I wouldn't have problems when I fly with my ESA. I've flown with my little buddy several time this year already and never have a problem in the airport or on the planes. Check in has been easy, and even at the security checkpoint getting through is simple. 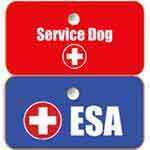 Sometimes they ask about my dog, but then notice he is an ESA when I take his ESA vest off to go through the metal detector. Nice to be able to pick the kit you want with JUST the items you really need. Don't have to waste money on stuff you don't really need or want. I actually used the psychological service they referred on their website (CPS) and Dr. Snodgrass was great to deal with. Got my ESA letter from him and also the kit from NSAR within a few days. I wanted the vest with patches along with the documentation in their basic kit, and the deluxe kit saved me money. When i opened the package, I was surprised at how good the quality of everything was. It's such a pleasure to actually get your money's worth!